Moving on the surface of water allows a microrobot to evade submerged obstacles and reduces drag. Using four pairs of asymmetric flaps and custom designed swimming gaits, HAMR robo-paddles on the water surface to swim. Exploiting the unsteady interaction between the robot's passive flaps and the surrounding water, the robot generates swimming gaits similar to that of a diving beetle. This allows the robot to effectively swim forward and turn. "This research demonstrates that microrobotics can leverage small-scale physics—in this case surface tension—to perform functions and capabilities that are challenging for larger robots," said Kevin Chen, a postdoctoral fellow at the Harvard John A. Paulson School of Engineering and Applied Sciences (SEAS) and first author of the paper. "HAMR's size is key to its performance," said Neel Doshi, graduate student at SEAS and co-author of the paper. 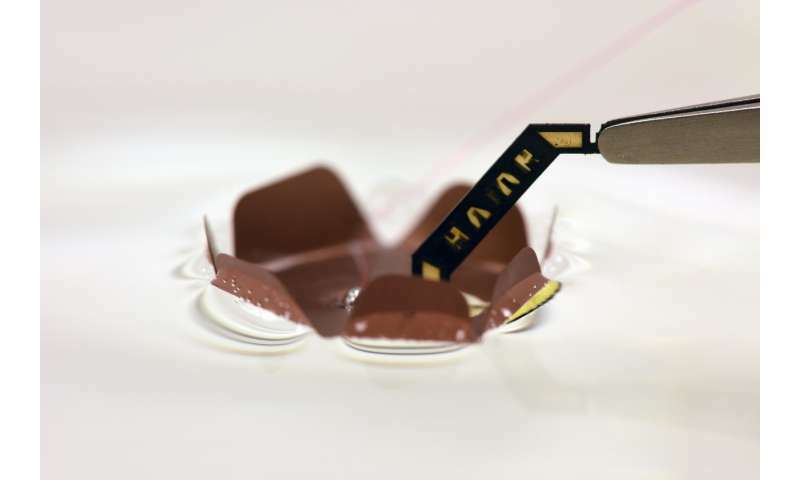 "If it were much bigger, it would be challenging to support the robot with surface tension and if it were much smaller, the robot might not be able to generate enough force to break it." HAMR weighs 1.65 grams (about as much as a large paper clip), can carry 1.44 grams of additional payload without sinking and can paddle its legs with a frequency up to 10 Hz. It's coated in Parylene to keep it from shorting under water. Once below the surface of the water, HAMR uses the same gait to walk as it does on dry land and is just as mobile. To return to dry land HAMR faces enormous challenge from the water's hold. A water surface tension force that is twice the robot weight pushes down on the robot, and in addition the induced torque causes a dramatic increase of friction on the robot's hind legs. 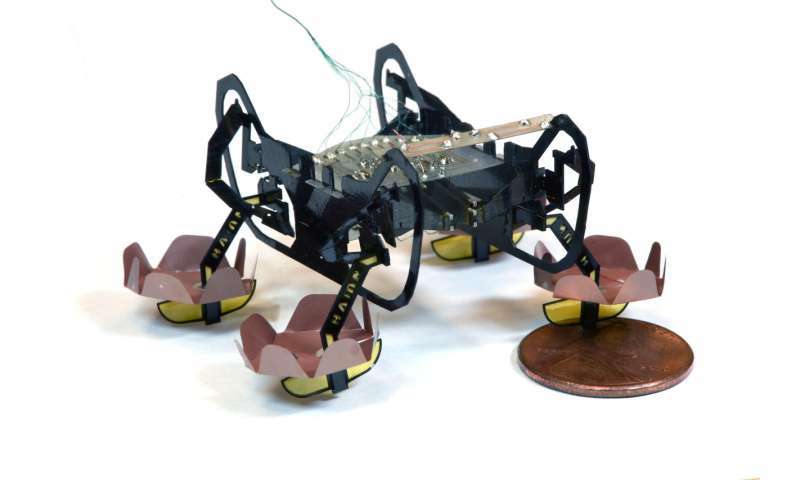 The researchers stiffened the robot's transmission and installed soft pads to the robot's front legs to increase payload capacity and redistribute friction during climbing. Finally, walking up a modest incline, the robot is able break out of the water's hold. "This robot nicely illustrates some of the challenges and opportunities with small-scale robots," said senior author Robert Wood, Charles River Professor of Engineering and Applied Sciences at SEAS and core faculty member of the Harvard Wyss Institute for Biologically Inspired Engineering. "Shrinking brings opportunities for increased mobility—such as walking on the surface of water—but also challenges since the forces that we take for granted at larger scales can start to dominate at the size of an insect." Next, the researchers hope to further improve HAMR's locomotion and find a way to return to land without a ramp, perhaps incorporating gecko-inspired adhesives or impulsive jumping mechanisms. Man this is cool. I founded a company called Mayku and we just launched a little vacuum former. Could be perfect for making a waterproof hydrodynamic casing for this little thing.